Have you ever considered setting up your own baby and toddler sale and not quite known where to start? We are offering the opportunity to use our well known and respected brand, our experience, our fantastic website and associated marketing material to get you up and running and then ongoing support to help you be successful and earn money! All of the ‘behind the scenes’ technical processes are taken care of leaving you free to use your skills to organise and run successful sales! We have put the work in already so the next steps are easy for you. With commitment and passion to succeed, good knowledge of social media and how to use the internet along with great people and social skills, you can do it! A totally flexible working life where you chose your schedule. No experience is required but enthusiasm is a must! We will guide you through every step of the process of setting up your own sale, from locating venues to how to advertise the events with really clear step by step instructions. Friendly, approachable and good at verbal and written communication. Happy to organise and run events. Ready to run and administer your own business. The fantastic thing about running a Lots for Tots baby and toddler table top sale is the more you put in, the more you will get out. If you would like to start a sale in your area get in touch before it gets snapped up by someone else. Want to know more? 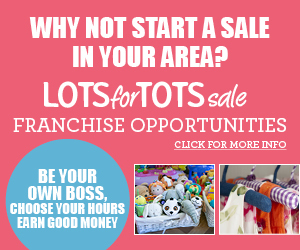 Just email us with your preferred locations or any questions and we will send you a franchise information pack.